On September 10, 1864, the reinforced skirmish line of the Union Third Division, Second Corps under Gershom Mott played a “mean Yankee trick” on their Confederate counterparts, changing the relative positions of the picket lines south of Petersburg near Forts Hell and Damnation. In early September 1864, the Confederate pickets of Mahone’s division, Harris’s Mississippi Brigade and Finegan’s Floridians, held high ground at “the Chimneys”, all that was left of the Gregory House just west of Jerusalem Plank Road and between the main lines of the opposing armies. This spot was also in between the famous forts, “Hell” and “Damanation”, which so often traded artillery fire during the Siege. Fort Hell was Union Fort Sedgwick, located astride the Jerusalem Plank Road southeast of the Chimneys. 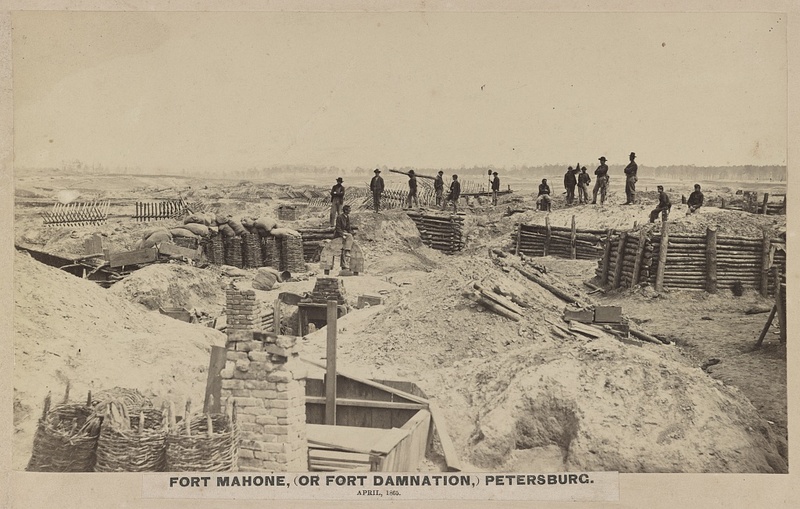 For Damnation was Fort Mahone, a work that jutted out from the main Confederate line and stood west of the Chimneys. The Federals of Gershom Mott’s Third Division, Second Corps manned the picket line near Jerusalem Plank Road. Union Second Corps commander Winfield Scott Hancock and Division commander Mott wanted the high ground at the Chimneys to provide an advantage for their picket line. 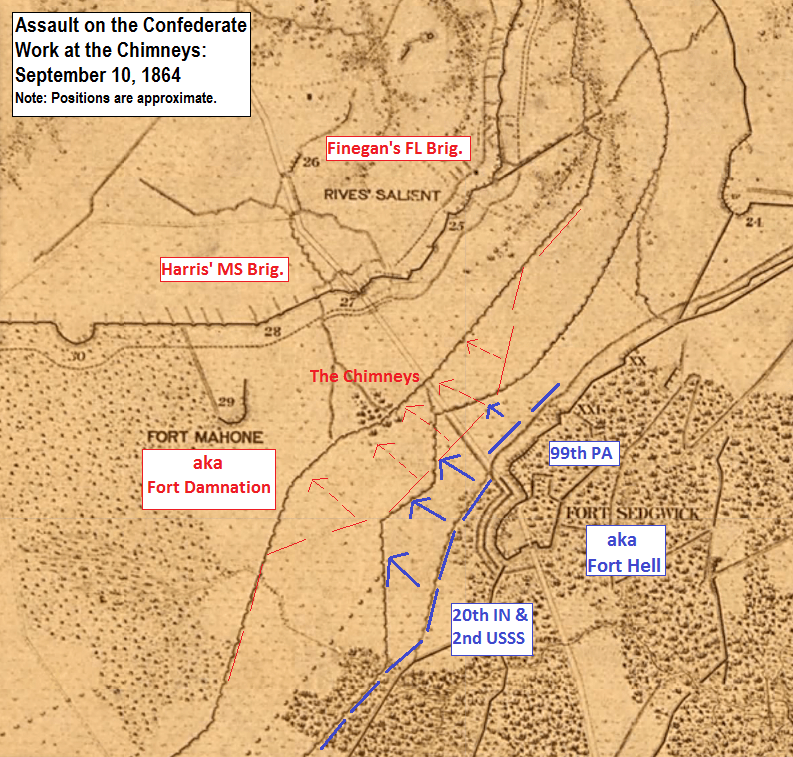 And they planned an assault for the early morning hours of September 10, 1864 to gain it. Three regiments of Regis de Trobriand’s First Brigade, Third Division, Seconds Corps were involved in the operation. Lieutenant Colonel George W. Meikel’s 20th Indiana was to make the first assault on the picket line at 1 a. m. on the morning of September 10, 1864. They were placed in the picket lines from about a half mile west of the Jerusalem Plank Road to the road itself. Their job was to overwhelm the Confederate pickets at the Chimneys, and then hold on to the captured works. While they were fighting off any counterattacks, the 2nd United States Sharpshooters, also under the command of Meikel this day, would be busy connecting the newly captured works to the rest of the existing Union picket line. Lastly, the 99th Pennsylvania under Col. Edwin R. Biles, was to advance just to the east of Jerusalem Plank Road and also try to take a more advanced position there in the confusion. The attack was initially a rousing success. The 20th Indiana under Meikel successfully captured the Confederate picket lines on the high ground just west of Jerusalem Plank Road, and bagged about 100 prisoners of Harris’ and Finegan’s brigades in the process. The 2nd U.S. Sharpshooters were then able to link those advanced positions back to the main Union picket line. Col. Biles and his 99th Pennsylvania were also initially successful east of the Jerusalem Plank Road, but they ran into trouble. In the darkness, Col. Biles was unable to refuse his right flank to tie back into the main Union picket line. His right was extended forward somewhat, leaving a gap between this flank and the main Union picket line. The Confederates exploited this gap and drove in his flank with some loss. Despite the poor showing by Biles, the main Union objective had been reached, and the new line held successfully. The Yankees had moved closer to Petersburg and gained an advantage, however small, on this hotly contested front. It hadn’t happened without loss, however. Lt. Col. Meikel was shot and killed later in the morning on September 10, while his 20th Indiana continued to hold the captured pits. His name would later be given to Fort Meikel, located to the northeast down the line of Union fortifications. At the moment, I don’t have any additional information on the Confederate side of affairs, as so often has happened in these 150th posts. One of my goals over the coming years is to fully investigate these actions and skirmishes and ultimately “fill in” more of the Confederate side of the story if/when sources become available. If you have more information from the perspective of Harris’ and Finegan’s brigades in this fight, please Contact Us. We’d love to hear from you. Likewise, the map used shows the situation of the picket lines and fortifications as they stood much later in the Siege. Please do not take the representation shown on the map above as exact. It is an early attempt by me to give you the reader a better understanding of approximately where the action happened. Chimneys, VA., Sept. 10, 1864. 3d Division, 2nd Army Corps. The Chimneys was a point on the Confederate lines near the Jerusalem plank road south of Petersburg, near two redoubts which the soldiers had named “Fort Hell” and “Fort Damnation.” Brig.-Gen. Gershom Mott, commanding the 3d division, submitted a plan, which was approved by the commanding general, to drive the enemy from his rifle-pits in front of the Chimneys, and at midnight on the 9th massed his troops for that purpose. At 1 a. m. on the 10th the 20th Ind., under Lieut.-Col. Meikel, made a rush and carried the rifle-pits capturing about 100 prisoners. The 2nd U. S. sharpshooters then advanced and perfected the connection between the captured pits and the Federal lines. Col. Biles, with the 99th Pa., on the right of the plank road, became confused in the darkness and occupied a line somewhat in advance of the one intended, held it until daybreak, when he was forced to retire with some loss. The Union casualties were 8 kiled, 14 wounded and 59 missing. HEADQUARTERS THIRD DIVISION, SECOND ARMY, September 14, 1864. CAPTAIN: I have the honor to report that in accordance with a plan submitted to and approved by the major-general commanding the Second Corps to drive the enemy from their rifle-pits at the point known as the Chimneys, on the Jerusalem plank road, and to occupy said pits as my picket-line, at 12 o’clock on Friday night I had the division to take arms without any noise, so as to be ready for any emergency, while Lieutenant-Colonel Meikel, commanding the Twentieth Indiana Volunteers, and the Second U. S. Sharpshooters, massed on the hollow ground in front of our breast-works, and on the left of the redoubt, which, having no name, is called by the soldiers Fort Damnation,+ At the same time, Colonel Biles commanding, the Ninety-ninth Pennsylvania Volunteers had taken a position on the right of the plank road and in front of the redoubt known as Fort Hell. These movements were executed with perfect order, and so quietly that the pickets of the enemy, in spite of their proximity, did not suspect anything as going on. Instructions were given to Lieutenant-Colonel Meikel to strike at a rush with the Twentieth Indiana Volunteers the enemy’s line half way between the Chimneys and the point where our main line was to connect with the old one; to double up and carry on the right all the rifle-pits up to the plank road and establish his line there, reversing the old pits, &c., while the Second U. S. Sharpshooters would perfect the connection between the captured pits and the old line, the enemy to be driven by the bayonet, and without unnecessary firing. *But see revised statement, p.119. +Officially known as Fort Mahone. rifle-pits from that point to a certain tree, where my old line of pickets had been advanced during the previous night in view of the contemplated operations. The colonel being deceived by the darkness, and carried on by the success, did not stick literally to his instructions, but having got beyond the limits assigned, occupied a portion of the enemy’s rifle-pits which only ought to have been leveled. The consequence of this more bold than wise advance was to put a part of his regiment in a position untenable after daybreak, and to involve the loss of 2 officers and 52 men when they had to retire, leaving a gap open where they should have established themselves strongly during the night. It was at this place that Lieutenant George W. Ellsler was killed and Captain Thomas A. Kelly wounded and taken prisoner, both bravely defending the undefensible pits, both of the Ninety-ninth Pennsylvania Volunteers. However, the mistake arising from the darkness of the night, as well as from a generous impulse to pursue a retreating foe, did not otherwise impair the complete success of the operations, the gap having been filled with great ability by Captain H. G. Harrower, Eighty-sixth New York Volunteers, while in charge of the pickets, during the following night. My picket-line is now strongly established on the crest in front of the main works, part of which was formerly occupied by the enemy’s pickets. I have the honor to report that the officers and men engaged in the operation most gallantly did their duty, and performed the work instructed to them in a manner worthy of their old services and well-earned reputation. Thanks are due to Brigadier-General De Trobriand, commanding First Brigade, who had a general supervision of this delicate movement, and gave it his undivided attention; and to my their to my entire satisfaction: also to the different battery commanders on the line, who fully carried out instructions, and effectively silenced the guns of the enemy that opened on us. It is with deep regret I have to report the death of Lieutenant Colonel George W. Meikel, Twentieth Indiana Volunteers. He fell on Saturday morning, on the ground wrested by him from the enemy with marked ability and his usual gallantry, and died with the consoling feeling of a victory, the most arduous and important of which was due to his generous efforts. HEADQUARTERS SECOND CORPS, September 17, 1864. Respectfully forwarded together with a return of casualties. The number of prisoners reported as received by the provost-marshal of the corps is 83 aggregate. The line which we desired to occupy as a picket-line is now in our possession, so that the operation in justly claimed by General Mott as a complete success. HDQRS. THIRD BRIGADE, THIRD DIVISION, SECOND CORPS, September 12, 1864. On receiving orders advising me of a movement on our right, the Fifth and Eleventh New Jersey and Eleventh Massachusetts Volunteers were sent to the front in reserve with instructions to be in readiness in case of need to support our picket-line at the advance. Having increased before the strength of the pickets, the headquarters of this brigade was moved to the reserve during the operations. When the advance was made at 1.30 a. m. the detail from the Sixth New Jersey Volunteers advanced with the right of our line with their pickets, and, after successfully driving the enemy, occupied their line in our front in company with the Second U. S. Sharpshooters. Toward morning, at about 3 o’clock, when the enemy threatened the right of our line, re-enforcements were sent from the Sixth and Eleventh New Jersey and Eleventh Massachusetts Volunteers, under a most rigid fire. The effort of the enemy to retake this part of the line was twice repulsed and the picket-line firmly held. During the operations the whole command stood under arms ready for any emergency. On the evening of the 10th orders were received to advance during the night the left of our picket-line, which, under a heavy musket fire of the enemy, at about 2 a. m., was done equally successfully. The enemy has since kept up a constant firing, thus causing daily casualties. Actg. Asst. Adjt. General, Third Division, Second Corps. GENERAL: Five deserters and fifty-seven prisoners of war were forwarded this a. m. from General Mott’s Division, Second Army Corps. The deserters are all from the Eleventh Florida, Finegan’s brigade, and came into our lines shortly after dark last evening, just previous to the capture of the prisoners. The prisoners represent two brigades of Mahone’s division, Finegan’s and Harris’. Ten of them are from the Twelfth, Nineteenth, and Forty-Eighth Mississippi, of Harris’ brigade, and the remainder from all the regiments of Finegan’s brigade. The picket-line of Harris’ brigade was attacked by us near its left where it joins Finegan. Harris’ Brigade lies to the right of Finegan. None of the deserters or prisoners give any information of importance. The position of Hill’s corps remains unchanged. Some of them report a division of Longstreet in rear of Mahone; suppose it to be Field’s division. More than half of Finegan’s men seem anxious to take the oath of allegiance and go North. GENERAL: Twenty-four prisoners of war from the Twelfth, Sixteenth, and Nineteenth Mississippi have been forwarded from the Second Army Corps in addition to those received early this a. m. The total number received this far is eighty-three, representing only Harris’ and Finegan’s brigades. The last bring no additional information. General Mott reports at 1.30 a. m. that he has carried the enemy’s rifle-pits and is establishing his line on the crest near the plank road. It was done by the bayonet. He has a few prisoners and is reversing the line. About 3 this morning the enemy attacked the right of my new picket line, recapturing the picket-pits to the plank road. From that point I hold and have reversed their line for about half a mile to the left of the road. I occupy the crest at the Chimneys. At this point the enemy’s picket-pits are about fifteen yards from ours and I anticipate war tonight. There was some bad management in placing the right of the line last night. It was intended to fill up the enemy’s pits there and make a new line along the edge of the ravine, but the regimental commander extended his line down the ravine, which subjected him to a flank attack. I believe I sent up about 90 prisoners. My own loss in killed, wounded, and prisoners is about 40, I hear, though it may be less. Lieutenant-Colonel Meikel, Twentieth Indiana, was severely, if not mortally, wounded. Picket-firing is sharp there today. Since last report he whole of the Second Division has been placed I camp near the Deserted House. The First Division is camped near the Jones and Chieves houses. Both divisions have large details still at work cutting timber in front of the rear line. The picket-line in front of the advanced works on the plank road was advanced last night to the position heretofore held by the enemy. About 80 prisoners were captured. What is the result of your operations of this morning? We captured about 90 prisoners and secured the crest about the Chimneys. The enemy made one or two attacks to regain the position, and succeeded in capturing about 30 men from one flank of the new line, but they met with no great success. I am about going up to examine the line and will telegraph you again. The general is asleep. CAPTAIN: In obedience to instructions previously received, all the batteries of this corps bearing upon the enemy, and also the line of batteries from Fort Hell to the Norfolk railroad, under command of Captain Harn, were got under arms at 1 o‘clock this morning to support a movement of General Mott’s division against the enemy’s picket-line. The movement was I believe successfully made. The enemy fired but few musket shots on the advance of our line, but son after opened with artillery fire from their main work in front of Fort Hell, directing their fire principally down the plank road. Only an occasional shot from a rifle battery to the right of Fort Hell was sent in reply to this, but later upon the enemy’s feeling our line with infantry the other batteries on the line were opened, and up to this time skirmishing has been kept up and frequent exchanges by the artillery. No casualties to this command. CAPTAIN: The line on the crest is being secured, and I do not expect any trouble. About 60 prisoners are reported; more are taken. It was gallantly done by the Ninety-ninth Pennsylvania Volunteers, under Colonel Biles, the Twentieth Indiana and Second U. S. Sharpshooters, under Liuetenant-Colonel Meikel, the whole under the supervision of Brigadier-General De Trobriand. P. S.—The enemy says it was a mean Yankee trick. COLONEL: The brigadier-general commanding [Mott] directs that you relieve all the troops on picket of the First Brigade which are posted to the left of the Jerusalem plank road; that the Second Regiment U. S. Sharpshooters when relieved from the front by you will be stationed in the fort located on the said plank road as an addition to the regular reserve for the pickets. You will be particular that the connections are made both on the right and left, that the works are strengthened, and that every effort that can will be made to hold the picket-line against any attack of the enemy. The greatest possible vigilance will be exercised both by the pickets and reserves; they will be constantly on the alert, as the position gained last night is most important, and it is expected the enemy will make great effort to regain it. A detail of 100 men from the Second Brigade will relieve the left of your picket-line, under the direction of the division officer of the day. On Friday [September 9, 1864]* the enemy captured a small party of our pickets south of the town. This driving in and capturing of pickets is a thing of daily occurrence when great hostile armies are in close proximity. Both sides practise it, and all reflecting pickets, when on outposts, consider their being captured or “driven in” as among the most probable of events. *The Examiner probably meant Friday night, which was really 1 a.m. Saturday morning. I’m almost certain this article refers to the Chimneys action.